Tubbataha Reef is an atoll coral reef located in the Sulu Sea, 98 nautical miles (181 km) southeast of Puerto Princesa City, Palawan, the Philippines. 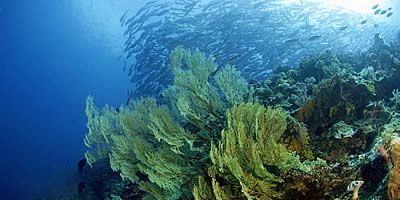 It is a marine sanctuary protected as Tubbataha Reef National Marine Park. Declared a World Heritage Site by the United Nations Educational, Scientific, and Cultural Organization (UNESCO) on December 1993, it is under protective management by the Phillipines Department of National Defense (DND). It is under technical supervision by the Palawan Council for Sustainable Development (PCSD) & the Department of Environment & Natural Resources (DENR). It is administered as part of administered as part of Cagayancillo town on Palawan. The reef is composed of two atolls, North and South Reefs. Each reef has a single small islet that protrudes from the water. The atolls are separated by a deep channel 8 km (5 miles) wide. Over one thousand species can be found at on the reef; many are already endangered species. 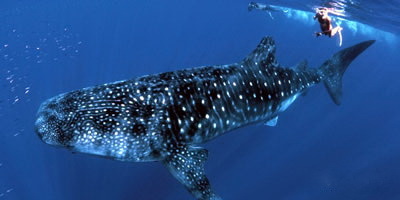 Animal species found include manta rays, lionfish, pawikan or tortoise, clownfish, and sharks. There are no permanent inhabitants of the islets or reefs. Fisherman visit the area seasonally, establishing shelters on the islets. The park is visited by tourists, particularly divers. 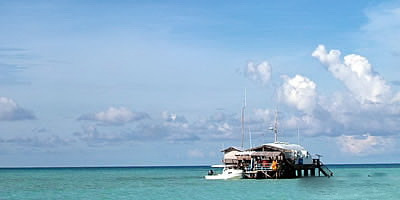 Trips to Tubbattaha from mid-March to mid-June are all vessel-based; the park is about twelve hours by boat from Puerto Princesa City. Tubbataha is considered as the best dive site in the Philippines and the diving dedicated ships that opearte during the "Tubbataha Season" are usually booked years in advance especially during the Asian holidays of Easter and "Golden Week"
A marine sanctuary having a reef of enormous size is the Tubbataha National Marine Park located at the Central Sulu Sea. It was established in August 11, 1988 with an area of 33,200 hectares (82,000 acres). In 2006, President Gloria Macapagal Arroyo, through an Executive Order, increased the boundaries of the park by 200%. It is now 96,824 hectares (239,000 acres) in size and is guarded by armed rangers 24 hours/ 7 days a week.